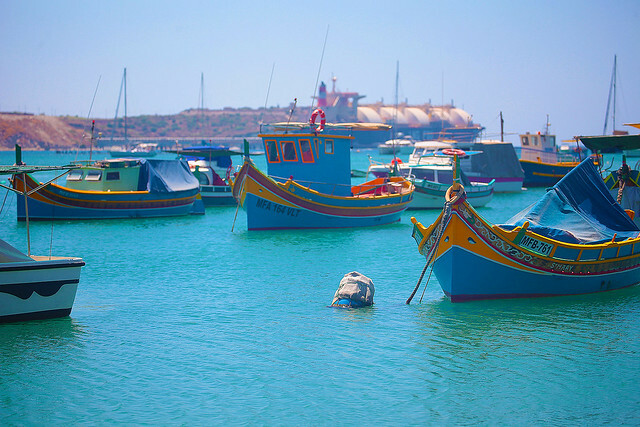 The small and picturesque fishing village of Marsaxlokk (pronounced marsa-schlock) is located in the South Eastern part of Malta. 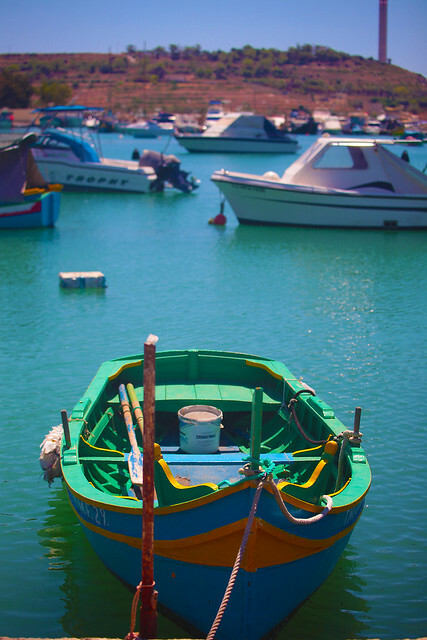 The name is a composition of “Marsa” meaning harbor and “Xlokk” meaning southeast in Maltese. 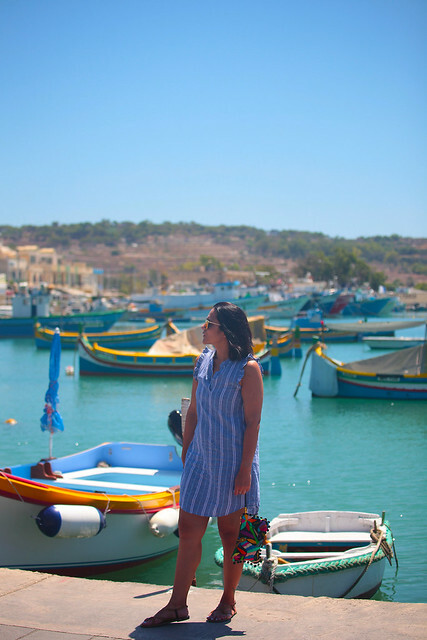 Marsaxlokk has about 3,500 permanent residents and it’s a small fishing village where most of the action revolves around the harbor. The biggest feature is the luzzu boats with their colors and eye in the front, which will protect the boat out at sea. 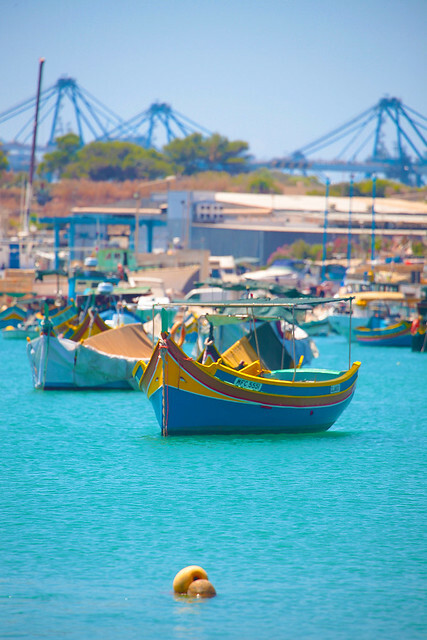 Despite its small size, Marsaxlokk is of great importance for fish trade in Malta. Most of the fishermen namely come from here and on weekdays the catch is being sold in Valletta. St Peters Pool: This stunning rocky part of the shore provides a quiet spot for swimming and sunbathing. Parish Church: Marsaxlokk church is dedicated to Our Lady of the Rosary, The Madonna of Pompeii. There are various village feasts with religious processions and spectacular firework displays throughout the year. Inside the church one can see the statue of the Madonna and Child, which came from Lecce, Italy in 1900. The Fish Market: The popular fish marked attracts hundreds of locals and tourists who are interested in buying the freshest catch. It was actually here that the Phoenicians landed on the 800-century and formed the first commercial stations in Malta. When the Ottoman troops began their siege of Malta in the 1500s, they used the harbor as an anchorage place. So beautiful! Love that dress on you! What a beautiful village! Looks like an amazing trip! What a gorgeous place! I would love to visit here! What a beautiful place! The photos are stunning. I also love your outfit :) goes perfect with the setting! This destination is gorgeous and looks so serene!! Perfect for a calm quaint getaway! The colors of these photos are amazing! An absolutely beautiful place! The city looks beautiful! I love how colorful it is! What a beautiful place to visit! Your outfit is super stylish and those colorful boats are so neat! What a gorgeous city! I love how colorful the boats are, they are even brighter in the blue water! What a beautiful and colorful place! It looks almost surreal. What a neat place to visit! 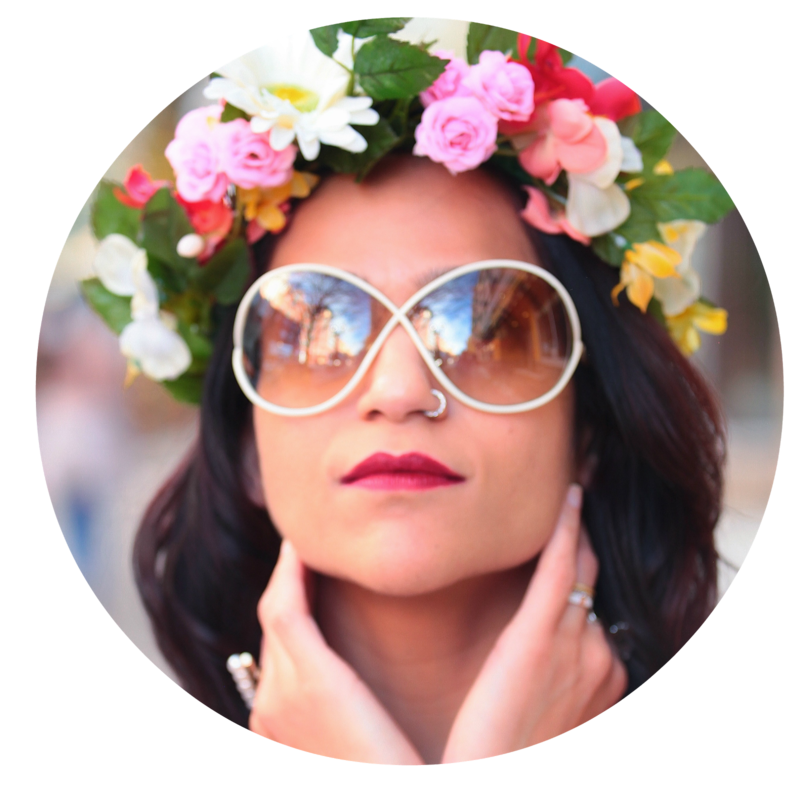 Love the format of your blog. Very well laid out. This place looks amazing. What deep colors. And your outfit is certianly to die for. Very well put together. Great photos- I love the colours, especially of the water! And your dress is super cute! This place is gorgeous. I love the boats in the back! Malta is definitely on my go to list. I would probably go to the fish market as I love sea food. I hope you had a great time over there! 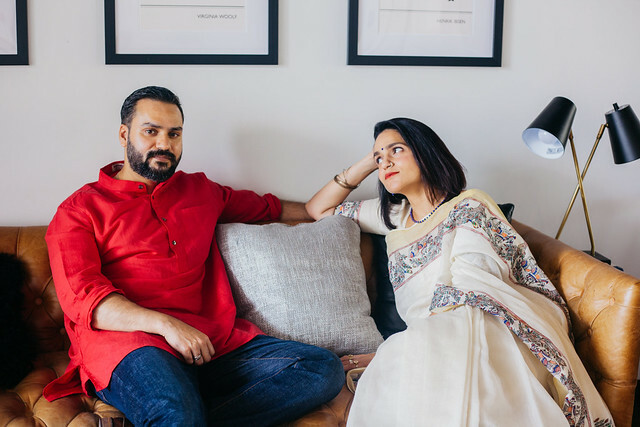 What a lovely place Tanvi! Also, such an interesting history. I love your look (as usual) so simple yet always on point. Wow so beautiful! I actually might be heading to Malta next month, definitely going to keep this tips handy! What a beautiful area!! Your look is very vacation! Love the clutch too! oh my! I am crazy about boats (getting my boating license now). This photos are helping me to stay motivated! What a beautiful place, so colorful and lively. You look amazing and absolutely beautiful pictures. What a beautiful, colorful, place to visit! So many colorful boats. Those luzzos are so cool, as is your dress. Thanks for sharing this great spot in Malta. This place looks incredibly beautiful. t's not just the sight of the lovely waters, there's an aura of splendid comfort all around it. 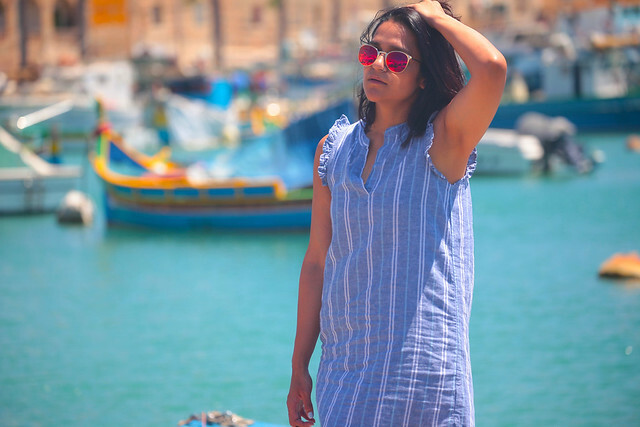 I'll be putting Marsaxlokk's Luzzus on top of my travel priority list! The color of the water is breathtaking!! It looks like you had such a great time in Malta. The fishing village sounds amazing and I love all the bright colours that are standing out in your photos! Sounds like such a fun and interesting trip! I’ve never even heard of this city, but it looks beautiful! The water is so blue!